The Latin term memoria traditionally refers to the Classical ars memoria, or “art of memory,” techniques developed to collect and retain ideas and knowledge—what we now call mnemonics. A common technique of memoria was the construction of a virtual space­­—often a temple, theater, or room—features of which would be assigned to concepts and information. These elements could then be discovered and employed to “invent” or construct statements during oratory and debate. 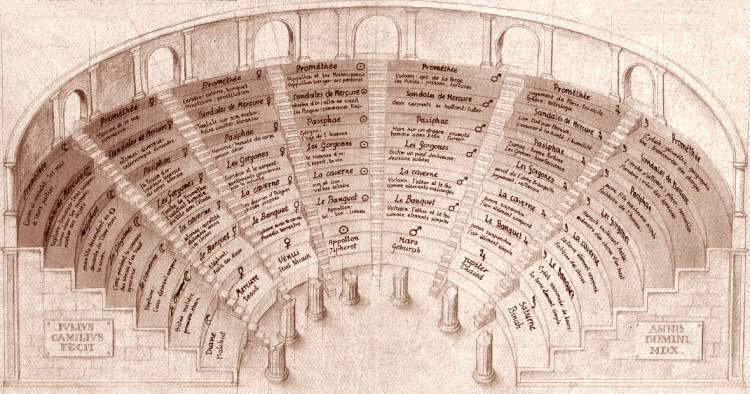 In the Renaissance, the memory theater or temple became associated with a more abstract project: constructing a catalogue of universal knowledge contained and represented in a virtual space. And so I very loosely use this phrase to describe the site Memoria Mundi. It is a catalogue of sorts: a “Temple of Time” that houses the less-familiar items, ideas, trends, narratives, and other detritus constituting history and culture. In short, Memoria Mundi is my cabinet of curiosities, an episodic, achronological, and apolitical hodge-podge, by its very nature a problematic and incomplete reconstruction of the past. It unapologetically makes no claim to be otherwise. But—I hope—you will find this Temple of Time an interesting and stimulating place to visit. Please take a look around. You can stay as long as you’d like.